This summer the Iranian government issued a postage stamp on the novelist Dowlatabadi’s 74th birthday commemorating his lifetime of work. Despite the regime’s professed respect for the art of the novelist, Dowlatabadi’s The Colonel is still not published in his own country. It was first published in Germany, where it was shortlisted for the 2009 Haus der Kulturen Berlin International Literary Award. After publication in Britain, the novel was longlisted for the 2011 Man Asian Literary Prize and it won the 2013 Jan Michalski Prize for Literature. This novel was begun by Dowlatabadi in the 1980’s and periodically added to and amended until the author declared it ready for publication in 2008. It relates the story of a man, military man of discipline and principles, who appears torn asunder by the change sweeping his country and his family in light of the 1979 revolution against the Shah which was the end of a 2,500-year history of monarchies. His wife is dead by his own hand for her adultery, and three of his children have been killed, two for their anti-Islamic tendencies, and one as a martyr for the cause of the new Islamic state under Khomeini. Two children remain, but the eldest son is sunk in an unresponsive nihilism as a result of the failure of the Communist faction he supported, and his daughter Farzaneh is married to an opportunist who shifts his allegiances with the changing political leadership. One of Dowlatabadi’s great skills as a novelist is reputedly to use language in an earthy yet lyrical way. We cannot enjoy the original Persian, but we can see the straightforward way in which he draws his characters, exposing their weaknesses and failures while at the same time acknowledging that one could not have done differently. "The colonel had always let his children find their own way in life...But now he could not help but wonder whether the dreadful fate that had overtaken every one of his children was in fact due to his laissez-faire approach. But no, this did not really provide the old man with an easy answer, either. He firmly believed that he had bequeathed to his children only the most natural of rights, namely the right to determine what they wanted to do with their lives...In the end, perhaps the colonel's wish that his children lead independent lives was a reaction on his part against a life which he felt had been imposed upon him. He felt that he had been short-changed by never having had the freedom to live his own life. This made him feel like some sort of cripple...At least one of you should look out for himself. It's not as though you were carrying the weight of all history on your shoulders! I'm not as strong as you think I am. That's what he really wanted to tell his children." Dowlatabadi describes an interrogation session, torture, and what jail is like. He describes the total confusion and uncertainty among family members and the general populace for years after the revolution when the political winds shifted to and fro. He describes the agony of a parent who is despised by his children and who has to bury his tortured 14-year-old daughter on a rainy night without help from his family. He describes the guilt and desperation of educated and serious patriots who no longer believed in god or goodness as a result of what they have seen and how their understanding of their most basic rights as humans felt violated. Even though I have not had much opportunity to read Persian literature, there can be little doubt about how such an open and painful account of despair would be received by a sitting government. "The colonel felt guilt, too--guilty for the very existence of his children, or lack of it, as the case may be." Apparently the present government in Iran would be willing to publish this novel in Persian if the author would make some changes, which he has refused to do. And yet, for his other work which is widely hailed in Iran as unique and masterful, Dowlatabadi is respected and honored by the postage stamp in his honor. "One would think that boys were born coy, but there lurks within them a dreadful, perverse force that can, in the blink of an eye, turn them into savage beasts, beasts that since the beginning of history have been easily drawn into committing the most appalling of crimes, just to prove themselves. They follow orders to the letter and call what they do acts of heroism. Can we blame them? What about us, the people who send these unformed lumps of soft putty out onto the street, where they fall into the arms of the first merchants of villainy they come across? And we just sit back and wait for them to be turned into rods to beat our own backs..."
This book is an important addition to the literature coming from the Middle East, and one hopes that one will never have read its like again. This book begins with the assertion of evil. It made me uneasy. I prefer to hear the facts and draw my own conclusions. But I am far less willing to grant King Leopold’s side another instant of attention after realizing that the facts had been obscured for a century or more by repression of documents relating to the case in Belgian state archives. Better that we finally uncover the ugly truth and take its lesson: unbridled greed may be the ugliest, most unforgivable, most unnecessary sin of all. Ulinich does something extraordinary here by combining her storytelling and drawing skills to create an absorbing graphic novel featuring the drama of an adult woman searching for love. This is not ordinary entertainment, but instead a realistic and riveting examination of the vicissitudes of finding love and keeping it. Lena Finkle is the twice-divorced mother of two who is about to get herself involved in an inter-continental relationship with a married man. When a friend wisely suggests Lena get more experience with men before she jumps into another unsuitable relationship, Lena forays into the world of online dating. Lena’s trenchant observations about her stumbling first steps in this direction are cringe-worthy best friend talk, admitting confusion, bad choices, and failure. To top it off, Lena has a homunculus on her shoulder making snide asides and expressing the observations Lena’s less rational side needs to hear. There is an energy in this novel that derives from the combination of cartoonish drawings and the wrenching real-life agony of misplaced and unrequited love. References to the online dating site OkCupid lower the tone; comparisons of Lena’s work as a novelist with Philip Roth, Bernard Malamud, Anton Chekov heighten the tension. It is an absurdist romp with heartbreaking consequences, and yes, this is indeed a sort of classic literature filled with naked vulnerability and deep intelligence. There is movement, introspection, growth, and understanding. Buying a pair of shoes might set off a flood of introspection, self-criticism, and a peering into the larger society: “buying a pair of red shoes wouldn’t constitute a punishable offense, but would certainly invite questions…which would load the shoes with too much significance to ever actually wear…which is why married people in Brooklyn are stuck in horrible moccasins and fleece sweaters they buy online…” The Scottish philosopher-lawyer-author Alexander McCall Smith couldn’t have said it better. The man she chose to learn from was not the perfect man: he was a device for making her more self-aware and accepting. Lena wanted to ignore her homunculus and friend Yvonne who told her not to close her eyes to the bright yellow caution tape in his conversation. Lena needed to be able to see, to listen to her homunculus even when she didn’t want to. Finally, understanding dawns. 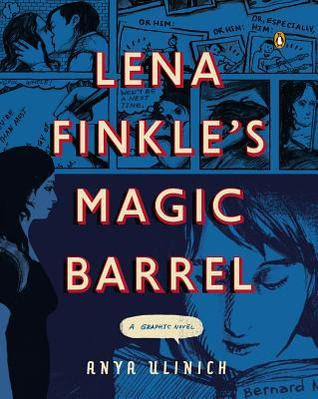 The name of Ulinich’s central character, Lena Finkle, is derived from two references that situate the character in the absurdist canon. Lena Dunham’s droll movie, Tiny Furniture, about a college graduate moving back into her mother’s apartment in the City, has an unforgettable scene about the struggle for intimacy—in a street-side construction pipe. This same hilarious and breathtakingly painful description of the nakedness of one’s need is keenly described in drawings and thought bubbles by Ulinich. I can’t recommend this novel more highly. Its dark humor and anguished understanding ties into some of the great literature of the 19th and 20th centuries but in a format that is finally coming into its own in the 21st century. The graphic novel format is uniquely suited to Ulinich’s skills. As always when an author manages a breathtaking high-wire act, I wonder if it can be replicated. But no matter, enjoy this one for what it is—an astonishing and absorbing example of high-intensity literature for our time. Many thanks to Ulinich for reminding us of Malamud's delicious little story once again. Zhao Ziyang, former Chairman of the Communist Party in China, was politically sidelined in May 1989 and went into house arrest as a result of his opposition to the government response to students occupying Tiananmen Square in Beijing. This fascinating personal and secret memoir recorded in the years after his arrest was published only after Zhao’s death in 2005. Bao Pu, son of Zhao’s trusted advisor, secretary, and speech writer, Bao Tong, transcribed, translated, and published the documents in his own publishing house in Hong Kong in 2009. Simon & Schuster published a U.S. edition with a Foreword by Roderick MacFarquhar, noted China scholar. In that Foreword, MacFarquhar notes that Zhao was an economic reformer but a political conservative in the 1980’s, but during his house arrest he became increasingly convinced that political change was both necessary and advantageous, i.e., economic development must be accompanied by development of an independent judiciary and the rule of law. MacFarquhar asks readers to consider that it took some years of house arrest for Zhao to come to these conclusions and wonders how much more difficult it would be for those involved in the day-to-day management of state and skirmishes within the Politburo to come to similar conclusions. Though Zhao Ziyang has been erased from public discourse in China today, he did have some notion that the demands of the students in Tiananmen were not essentially undermining the state, but all about modifying the state to better represent the will of the people. Reading the full narrative makes clear that Zhao’s position as Party Chairman in the spring of 1989 was already tenuous. He still had Deng’s support, but that was all. After his refusal to carry out Deng’s wishes in handling the student demonstration, his political career was finished. Hu Yaobang, in the chapter about his ouster, sounds politically tone deaf. When faced with conflict Hu ignored it or went out of the country. Hu was Party Chairman when Zhao was Premier. Hu was forced to resign in January 1987, and Zhao was asked to take his place, though he’d made clear that he did not want the role of Communist Party Chairman. He would have preferred to stay focused on economic issues as Premier. Zhao speculates that Hu was forced out because he suggested in interviews and by “loose talk” that Deng Xiaoping would (should) retire from making decisions. Zhao did the exact opposite with Gorbachev in 1989, suggesting that Deng was really in control of everything, and that Gorbachev, if he wanted the “final word” on anything, should meet with Deng. A little later we understand the reasons for this more fully. Corporate types who have lived/worked with a group of people who disagree but who never openly voice their disagreements and instead jockey for position by leaks or by willfully excluding someone from discussions will recognize immediately the stomach-churning turmoil of the 1980’s government of the most populous country on earth. Each individual was a planetary power shifting his weight, yet no one was precisely sure what the actual sticking points were since no one voiced their opposition openly. It appears that the shift of Zhao to position of General Secretary of the Party from Premier in 1987 was the beginning of his downfall. Though Deng Xiaoping created a Central Economic and Financial Leading Group with the intention that Zhao would keep his hold over the management of the economy while at the same time handling Party affairs, Zhao was sidelined and attacked by more conservative ideologues Li Xiannian, Wang Zhen, Hu Qiaomu and Deng Liqun. The real writing on Zhao’s headstone was Zhao’s failure to push through price reforms in the fall of 1988. He’d made preparation, proposed and supported the idea, but when it came to implementation he choked. Zhao’s chapter on official corruption gives a clear explanation of how vast sums can be channeled and manipulated through government enterprises unless there is price reform. Deng Xiaoping had made clear that he wanted this work done because all the economic reform efforts in the world couldn’t work properly without price reform. Deng said repeatedly that Zhao should be strong and if it all went sideways, that Deng would take the blame. But Zhao couldn’t pull the trigger, and the conservatives then had the ammunition they needed to refuse his recommendations as bank runs, inflation, and lack of available money from the center slowed the economy. Reforms were retrenched. Zhao later said that this was the thing he most regretted. Indeed, we learn something about the nature of leadership with his failure in this instance: a leader doesn’t necessarily have to be fearless, but he must be bold. A leader may be afraid, but he sometimes must make a bold move despite that fear (think Shackleton). I think Deng understood this. Deng himself was vulnerable to ultraconservatives who sought to sideline his influence, and he tried to preempt their attempts by resigning from all posts and suggesting other elderly statesmen do the same. What happens next is just the burying of the body. By 1989 Zhao must have known his position was extremely tenuous, and therefore convinced Deng not to resign his posts, knowing he would lose his powerful mentor and his one friend in the upper reaches of power. Zhao finally split with Deng over the student demonstrations, which Deng felt should be dealt with harshly, by forcing the students from the Square. If Western observers thought the political center in China was in turmoil during Tiananmen, they had missed the fact that power was being consolidated, in fact. Deng stepped down from his position as Chairman of Central Military Commission in 1989, despite promising Zhao that he would wait a year. Deng was still consulted on official matters until 1992. Zhao never was released from house arrest, and very rarely left his home. He died in 2005. His memoir of his final years was discovered at his home in plain sight, recorded over his grandchildren’s music tapes and tapes of Chinese opera. This memoir was both heartbreaking and heart stirring. It has the feel of truth—Zhao Ziyang’s truth—which is all we ask of a memoirist. Bao Pu did a great job condensing the material, providing explanatory text, and making a worthwhile testament to Zhao Ziyang’s life. Postscript: I read this because I recently read Louisa Lim's fine report on China today, which I reviewed earlier: The People's Republic of Amnesia. Oxford University Press, 6/4/2014, ISBN 978-0199347704. This Danish mystery series featuring Red Cross nurse Nina Borg in modern-day Copenhagen follows a long line of deliciously cosmopolitan and yet delightfully local novels translated and published by Soho Crime. Reading a few of the mysteries by these illustrious authors will give the reader an indication of the quality associated with Soho Crime: James Benn, Cara Black, Jassy Mackenzie, Leighton Gage, Timothy Hallinan, Martin Limon, Peter Lovesay, Qiu Xiaolong, Helene Tursten, Akimitsu Takagi, Matt Benyon Rees. Lene Kaaberbol and Agnete Friis are in good company. Crime and intrigue is all the more complicated in a Danish society famously known for its liberality. Invisible Murder is the story of a young gypsy Hungarian boy seeking to gain some control over the fates of his family by looting an old hospital left to rot by departing Russian occupiers. He intends to sell leftover X-ray equipment to the highest bidders in Europe, leaving himself and his family exposed to the most rabid and calculating bottom-dwellers in the criminal syndicate. We meet Nina Borg, a Red Cross nurse volunteering outside work with illegal immigrants to Denmark, and members of the Danish Counterterrorism Units who are chasing whomever accessed known terrorist sites on the internet while in their jurisdiction. We get a fascinating peek at the concerns of Danish society today, and the impetus for crime from the most underserved and exploited communities in the EU. This novel is the second in a series, and as such the authors may have missed an opportunity to present Nina Borg in the depth first-time readers need to accept her leading role. The book was long and complicated—perhaps more complicated than it needed to be. Some judicious editing or more time spend reducing the work to its essentials would have aided our understanding and interest starting out, but the action picked up in the last third and it stands as a solid entry in this crime series. Louisa Lim is an experienced China-watcher and has been an NPR and BBC reporter in China for at least a decade. She has completely captured a strange phenomenon of modern-day China: the heady mix of strong-arm political repression and an intolerant nationalism that is captured in the term “moral absolutism.” She shares the candid views of a cross-section of Chinese citizens and in the process manages to give an excellent update to our view of post-Tiananmen China. Lim gives us a series of snapshots that capture the ambiguity and nervous pride with which ordinary citizens view their government: “aren’t we better off than we were four years ago?” When a young girl chooses “official” as her desired profession “because they have more things,” there must be some sidelong glances and reluctant acknowledgements at the unevenness of officialdom's wealth creation. But the political consciousness of ordinary citizens is strangely truncated. Those aspiring to work for the government do so for economic security, not with hopes of political change or influence. The conversation started in 1989 by students at Tiananmen Square was not then ripe for democracy in China as we know it in the West, but some officials knew the risks to the Party and to the country of avoiding discussion of political reform and for suppressing the protests without some acknowledgement of their underlying discontents. That the conversation has been so utterly changed since the loosening of restraints with economic freedoms should not amaze me as much as it has. The government has effectively erased the memory of 1989, so much so that young people don’t even know about that time, and older folks don’t want to talk about it. How so many people can willfully forget that earlier moment when the stability of the Party was in jeopardy is explained: China’s turn towards economic liberalization happened because of Tiananmen. Lim peels back the veil on the events in Chengdu during June 1989 when protestors sympathetic to students in Beijing’s Tiananmen Square also marched and were also suppressed, beaten, jailed, killed. It astonishes me still that we don’t know the extent of the crime, and won’t either, until the government changes hands. Surely there was extensive documentation: some of the dead in Beijing and Chengdu lay for days in morgues or hospitals and photos of loved ones showing their injuries appeared many months after their deaths. I imagine one day it will be the Chengdu policemen who, on their deathbeds, wish to be forgiven and come clean with what happened in 1989. They must be as haunted as Chen Guang, the military photographer-turned-painter in Beijing, whose work at Tiananmen on June 4, 1989 haunts him still. Bao Tong was Policy Secretary for Zhao Ziyang and Director of the Office of Political Reform for the PCP before both were placed under house arrest in 1989. “Describing the mood at the highest levels of government Bao Tong painted an atmosphere so weighted by factional mistrust that any discussion of the issues was impossible…According to Bao Tong, [he and Zhao Ziyang] never had a single conversation about what stance to take toward the student movement. ‘This wasn’t something you would discuss,’ he said.” This remarkable and revealing admission reminds me that fear of reprisal haunts even the anointed in China, though the lack of discussion saved neither man. Tiananmen has not been forgotten by everyone, and the issues it raised are as valid today as they were twenty-five years ago. Undoubtedly some folks have begun to think about what political change would look like in a modernizing China. However, recent rhetoric from the center and the tight control the Party has on social discourse does not hold out hope for a “revolution from within” the Party. The change, when it comes, will be demanded by all those “moral absolutists” making up the population that the Party has created, and heaven help the Party then. Louisa Lim’s brave and unblinking look at modern China is a book I hadn’t known I was waiting to read. --Later: Lim mentions Zhao Ziyang's secret memoir of the Tiananmen debacle and I managed to rustle up a copy. I have reviewed it here: Prisoner of the State: The Secret Journal of Premier Zhao Ziyang. Simon & Schuster, May 2010, ISBN 9781439149393. This is far and away the best and most accessible translation I have read and I looked at several since 2010. But best of all is that it can now be listened to, as Pinsky's 1995 translation is read with great cognition by Poet Laureate Robert Pinsky, Nobel Prize Winner Seamus Heaney, Poet Laureate and Pulitzer Prize Winner Louise Glück, and Bolligen Prize Winner Frank Bidart, in a new production cosponsored by Penguin Audio and FSG Audio. It doesn't take long to listen to, and it packs a punch, just like the original should have. Dante's The Divine Comedy is an epic poem in three parts and was written in the 14th Century, at a time when oral traditions in storytelling were still prevalent. One benefits from hearing the work spoken aloud, as in all poetry. But in this audio presentation we get only Part I, The Inferno and not Purgatorio and Paradiso. How I yearn to learn that the latter parts will also be translated by Pinsky. I have read Part I many times, Part II once, and never Part III. I'd like to see what Dante has to say about heaven. The whole work was originally entitled Commedia, and in later centuries other artists added the "Divine." The meaning is the same: our God plays with us humans...setting us difficulties and seeing how we manage. Many of us fail. I came away wondering if this is the version of hell that the Catholic Church promulgated and has adhered to for centuries. Wikipedia says it is, and that in fact, Dante drew on St. Thomas Acquinas' Summa Theologica from medieval Christian theology. It is grim. It is horrible. It is hell in every definition. It is so similar to what I was taught that I wonder now how it is possible that so little has changed in Church teachings and at the imaginations of our religious leaders that no one has come up with a more hellish (or even a different) scenario. How little ignorance is excuse for wrongdoing in Dante's eyes. We have only ourselves to blame, he says. How clear our human moral conundrums seem from this fiery pit. Remind yourselves of moral wisdom, and listen, just listen to our greatest living poets read Dante. Joshua Wolf Shenk, celebrated author of Lincoln's Melancholy: How Depression Challenged a President and Fueled His Greatness, has a new book due out August 5 which focuses on the power of creative pairs. Using a number of compelling examples, Shenk posits that exceptional creativity is not the outcome of an individual mind, but requires the interaction of two minds. He will argue that three people change the creative dynamic. The concept of the “lone genius,” Shenk says, is overstated if not flat wrong. Describing a phenomenon many of us have experienced firsthand, either personally or by observing others, Shenk posits that two well-suited creatives together experience a surge in their output that is greater than either individual could achieve on their own. He interviewed pairs who are not household names, but used mostly the examples of well-known creative pairs that each of us will recognize to illustrate the power of creative pairing. For this he mostly used the vast record that has grown up around such pairs as Steve Jobs and Steve Wozniak, John Lennon and Paul McCartney, C.S. Lewis and J.R.R. Tolkien, Warren Buffett and Charlie Munger, James Watson and Francis Crick. In each case, Shenk posits that each pair could be shown to have followed a set of stages that allowed and fostered groundbreaking creative output: 1) Meeting, 2) Confluence, 3) Dialectics, 4) Distance, 5) The Infinite Game, and 6) Interruption. Shenk’s theory is not as obvious as it appears at first blush. After all, he is saying creative genius does not stem from the individual alone. He allows us to consider this radical idea in the context of his many examples of successful creative pairs, either cooperating or in competition (Larry Bird and Magic Johnson), and gives us space to consider that this model may be the prevalent one for creative output, while the “lone genius” model (Einstein) is the exception that proves the rule. For those of us who relish contemplating the creative process and that magic moment when the lightbulb comes on, Shenk’s discussion of the creative interaction between Lennon and McCartney or between Picasso and Matisse is revealing and utterly fascinating. I immediately applied Shenk’s thesis to my [admittedly limited] knowledge of Harper Lee and Truman Capote working together on the groundbreaking non-fiction fiction In Cold Blood. It could be possible that the two friends created a competitive environment that pushed each to exceed their already considerable talent to contribute material that resulted in that unforgettable book. The competition between the two may have also spurred them each individually to excel. Marja Mills, in her recent The Mockingbird Next Door (July 2014) talks a little about the relationship between the two authors. Shenk uses his own experience with his editor as an example of the creative power of pairs, insisting that he is more clever and capable and productive when he is working directly with his editor, Eamon Dolan, whom he credits as co-creator of this book. It is a far more personal and reflective statement of theory rather than proof. Whether or not we believe this thesis to be true is hardly the point. We ourselves probably have examples of creative pairs we could consider within his outline. But whether it is true to the exclusion of the concept of “lone genius” is another matter. My mother once told me that “Nobody is successful on their own.” This always rang true to me, since “success” can only be realized in society. Joshua Wolf Shenk’s theory focuses on the creative spur to success and his thesis states that groundbreaking creativity also requires society. He says we can do something about our creativity by facilitating the conditions for its flourishing by finding someone with whom we resonate. It makes sense. More importantly for readers, perhaps, is that it is interesting. I am happy to offer a giveaway of this hardcover to an interested reader until August 5, when the book is published. (U.S. respondents only, please.) If you are interested in this title, you may fill out the form below. I will use a random number generator to choose a respondent. That reader will have two days to respond to my email with an address to which the publisher will send a hardcover copy of the book. Good luck and good reading! A winner has been chosen. Thanks for your participation!